Environmentalists can be annoying sometimes. I’m annoyed every time I use my expensive new dishwasher, which takes forever to run and still doesn’t get the dishes clean – unless I use enough detergent, which leaves me with soapy dishes. Bleah! I’m annoyed by my newish washing machine which doesn’t fill up with enough water. Wash a mattress cover? Fat chance! I’m annoyed by modern laundry detergents which leave a scummy film on clothes. I’m annoyed by modern faucets which take me forever to fill a mop bucket. And don’t get me started about modern toilets. Biofuel Bright for Whiter Whites! Once upon a time washing machines worked. You put in your clothes, added some powder, turned the dial, and BLAMMO! Out came clean clothes. More recently, they took the phosphates out of dishwasher detergents as well. If you notice that your dishes feel slimy, and you sometimes want to vomit if you don’t rinse out your glass before using, blame environmentalists – or government. Here’s the deal: plain old liquid soap removes grease quite well – as long as it continues to be soap. Soap is a sodium or potassium ion on one end and a fatty acid (or some synthetic organic thingy) on the other. The ion makes the soap water soluble and the organic thingy makes it kind of fat soluble. But hard water – and dirty clothes – can contain other metals like calcium, magnesium, or iron. These can swap places with the sodium. The result is not water soluble. The result is soap scum. Yuck! Phosphorus to the rescue! Phosphates grab those naughty unwanted metal ions and keep them from reacting with the soap. The result: clean clothes and dishes. And phosphates are non toxic (in low enough doses). The human body has all sorts of phosphate compounds within. Alas, phosphate is fertilizer. If the sewer plant lets the phosphates through, then the phosphates feed algae in the lakes and streams, resulting in yucky scum. Cattails love wet, nutrient-rich, conditions. As David Blume points out in Alcohol Can Be a Gas! cattails produce enormous amounts of starch per acre if you feed them treated sewer water. Break up the starch with already-existent enzyme technology and you get sugar – which can be used to brew up ethanol fuel. River scum is algae. Some varieties of algae can be used to make bio diesel. So use the scum! But grow it before the treated sewage gets into the waterways. Then there is hemp. Irrigate hemp with nutrient rich water and you get a whole bunch of cellulose. Use it for fiber, or fuel. For fuel, you can get methanol with destructive distillation. What’s left is charcoal, which can be used for heat or refining steel. 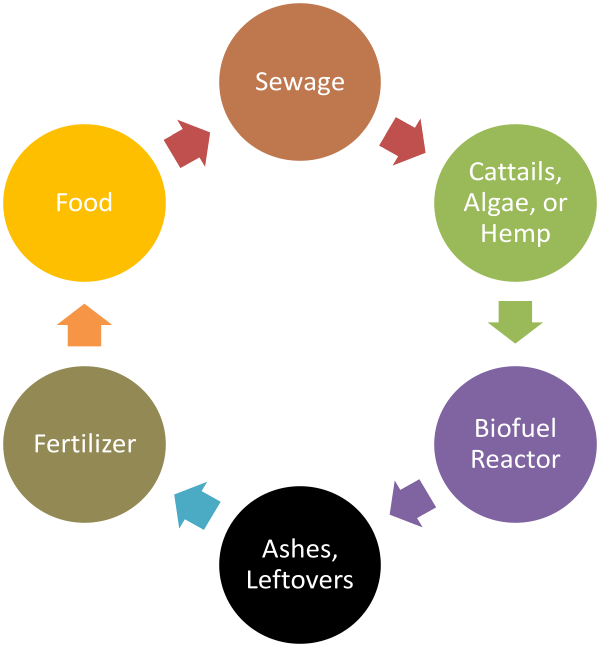 Biofuels make tertiary sewage treatment more economical. I wrote earlier that you could blame either environmentalists, or government. In the latter case you could be blaming small government(!) If the government spent more money on sewer treatment plants in order to take the phosphates (and other nutrients) out of the effluent, then we could have simple detergents that worked. Instead, the government passed the buck to the detergent makers, and so we have scummy towels and weird chemicals in our cleaning products. Clean waterways are a public good. Since many of our rivers go through or border multiple states, this is a federal issue. Funding high end sewage treatment is a proper function for the federal government! This doesn’t mean I want a bigger federal government overall. 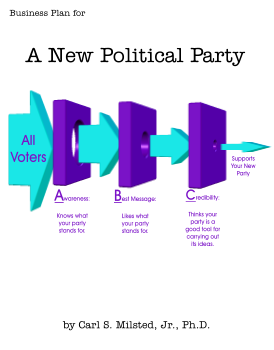 My political philosophy today is that each layer of government should do fewer things, but do those things well. By dabbling in matters that could be handled by states, localities or private organizations, the federal government is under-funding interstate matters like interstate pollution, patent examination, federal courts, customs inspection, border matters, securities law enforcement, etc. And a Congress distracted by too many issues is passing poor laws in many of these truly federal areas. There is another, very important, reason for tertiary treatment vs. phosphate-free detergents: even back in the day of phosphate heavy detergents, detergents only accounted for half to three quarters of the phosphates in treated sewer water. Back in 1970 Mother Earth News reported that humans waste contributes about 1.4 pounds of phosphorus per person per year while detergents contributed 1.5 to 2 pound per person per year. So yes, phosphate detergents were a big component, but with a growing population it pays to recover the rest of the phosphates. 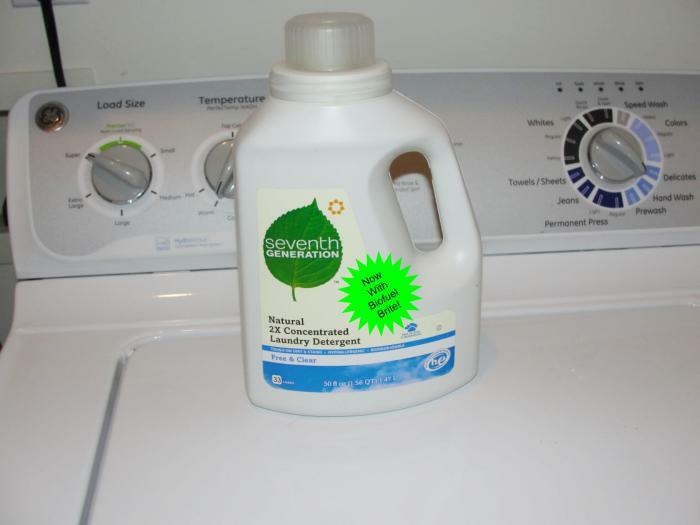 Phosphate free laundry detergents were a good quick fix. A better long term fix is tertiary treatment. And biofuels promise to recover some of the cost. All life on Earth depends on phosphorus. Yet phosphorus is not that common an element on Earth. With the human population pushing the carrying capacity of the planet, this can be a serious problem. There aren’t that many mineral sources of phosphate outside of Morocco, and that source is going to run out. We are dependent on fertilizer, including fertilizer with phosphates. David Brin alerts us to this looming problem in his eco-dystopias Earth and/or Existence (I forget which). In one or both of these grim futures men are expected to pee in separate containers for later pickup in order to recover precious phosphorus for fertilizer. These novels highlight both the beautiful and the idiotic in modern liberalism. The beautiful: liberals are quicker to recognize many current and looming problems which conservatives and libertarians tend to hand-wave away. The idiotic: liberals often embrace the first solution that comes to mind, no matter how inconvenient, ineffective, unpleasant, and/or expensive it may be. Bottled urine pickup is inconvenient, unpleasant and expensive. Extracting phosphates from water is a chemical engineering problem. Bulk chemical manipulation is an industry that the United States is particularly good at. It’s an industry that hasn’t been completely outsourced to Asia. In this case, however, a green spin on the tech may well be the easier solution. Use the nutrient rich waters to fertilize cattails, algae, and/or hemp. Extract fuel. The leftovers will be phosphate rich. Use them for fertilizer – or making detergents with phosphates. There are some problems. The first is that sewer treatment plants are often located within the cities they serve. Land for growing fuel crops is limited. The secondary treated wastewater will need to be piped away, generally uphill. This is an expensive bit of plumbing. Think of it as “shovel-ready projects.” This is the sort of government-private partnership that the old Federalists loved and modern Libertarians hate. In this case I will side with the old Hamiltonians. Out west there is a big potential benefit: the water thus pumped up hill can be used to recharge aquifers. If we kill the nasty bugs at the treatment plant and keep evil non-biodegradable chemicals out of the waste stream, plants can get rid of the nutrients, leaving clean enough water to seep down into the soil. I see one other potential problem: sodium. Most soaps and detergents are sodium based. We don’t want too much sodium getting into the soil and aquifers. It shouldn’t be hard to find sodium tolerant species of cattails and algae. But will they take enough of the sodium out of the water? Or will we need to move to more potassium based detergents? This is a question I leave to the enterprising readers in the audience. Wastewater treatment is usually a government function, so this is probably more of an opportunity for the non-libertarians in the audience. (But I did know an LP state chairman who was a consultant for municipal water systems…) There are opportunities for local governments, government contractors, farmers, and builders of biofuel reactors. Some teamwork is in order. The earlier opportunities are probably for smaller systems in areas where the ground is flat. Big cities tend to be next to large bodies of water and have wastewater treatment plants surrounded by development. To make Washington DC go green you would need to run a pipeline through miles of Maryland suburbs, or convert the local parks. Many small towns, on the other hand, are not located on rivers, and have farmland close by. Many county water systems already have plumbing running underneath miles of rural areas, and all along the coastal plains, the uphill is only a few feet. The downside of starting small is that your biofuel reactors will be small. Our fuel distribution system is geared towards huge economies of scale. But as I pointed out in the ethanol fuels chapter, for niche use small scale distribution might work. Larger scale early opportunities may arise out west. There, water conservation is a major issue. Artificial cattail swamps to recharge aquifers may justify some expensive plumbing. Once ye early adopters prove the technology, then it is time to hire some lobbyists to get federal funding where it’s really needed: cities around the Great Lakes and major river systems. We won’t get our phosphates back until we upgrade these wastewater systems.